Rex writes about all aspects of residential renewable energy, for both off-grid and grid-tied homes. Topics include photovoltaic and wind energy, solar hot water, geothermal energy, passive solar design, battery maintenance, solar water pumping and more. To read his latest magazine articles, get a copy of New Pioneer on the newsstand. As a regular contributor to Log Homes Illustrated and Log Home Living magazines, Rex wrote many articles about the various aspects of renewable energy as they relate to log homes, including several that profile off-grid and grid-tied log-home owners using solar and/or wind energy to power and heat their homes. Rex began his writing career while operating a Thoroughbred breeding / training facility, and running the John Ewing Company, a horse supplement manufacturing firm. His articles address horse nutrition, and a few fun ones, such as the first Kentucky Derby, and a tale about a long, turbulent relationship with a particularly spirited horse. 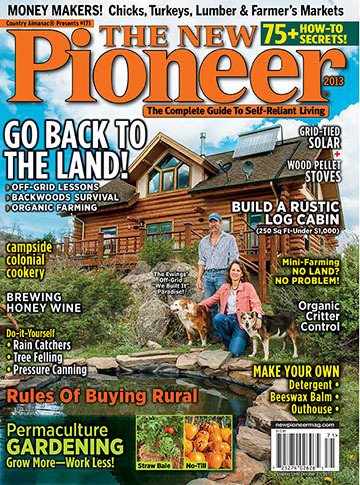 Rex and LaVonne Ewing on the cover of The New Pioneer Magazine (2013), with their dogs Tazi and Maggie.